Looking at beautifully crafted supercars is one thing that petrolheads of the world love to do. But one more thing that is entertaining to look at would be to watch them burn! No offense to the owner of the car but this is pretty funny (I also hope no one got hurt during this fire). This happened in the South Luzon Expressway, a highway I pass everyday of my life. My friend tells me that this is actually an engine problem of some sort and the owner of the Ferrari got a new one. I’m sure he got more than that because his life was put on danger. Either way, whatever the reason may be, it is still pretty entertaining to watch a very expensive car burn. I am not really that much of a fan of the F430. I would actually prefer the 599. I would consider the 599 Fiorano to be one of the first cars that I really fell in love with. It is just a beautiful piece of art that I could stare at for hours. When people ask me the “if you had the money to buy any car what would you buy?” question, the Ferrari GTB 599 Fiorano would be one of the top on my list. Maybe if it was a 599 on fire I would actually care. 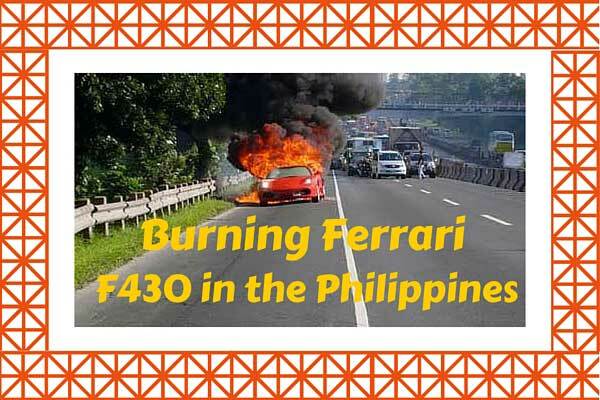 But this burning Ferrari F430 in the south super highway is just classic. I do hope no one was hurt during the fire though.